In a large, heavy soup pot or Dutch oven, heat the 3 tablespoons olive oil over medium-high heat. When it shimmers, add onion, carrot and fennel, stir, and sprinkle with salt and pepper. Cook, stirring, until softened and golden, 5 to 10 minutes. Adjust the heat to prevent vegetables from browning or scorching. Stir in bay leaf, thyme sprig, garlic, paprika and tomato paste and cook, stirring, 1 minute. Add broth, potatoes and a large pinch of salt. Bring to a boil, then reduce heat to a brisk simmer. Cook until potatoes are cooked through but still firm, 12 to 15 minutes. Taste and adjust the seasonings. 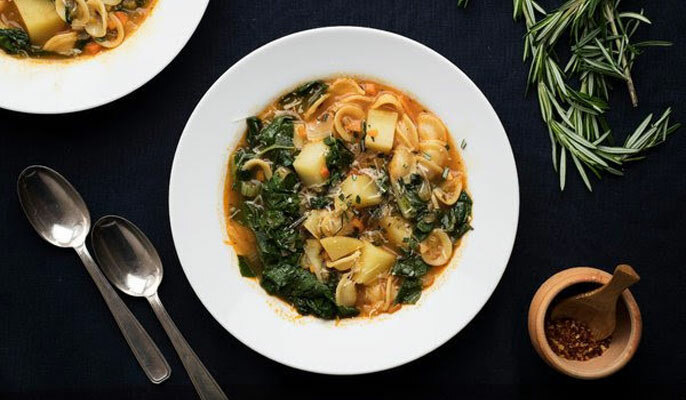 Ladle soup into bowls, and sprinkle with chopped rosemary and Parmesan. Drizzle each serving with a teaspoon of olive oil. Pass extra Parmesan at the table.